The “All-on-Four” solution is aimed at patients wanting to get rid of their dentures or for those in need of a complete upper and/or lower teeth restoration. This procedure is accomplished by placing four dental implantsall-on-four to secure the prosthesis or the replacement teeth, giving the patient comfort and security that is missing from removable dentures. 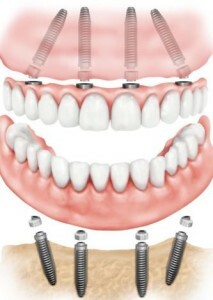 The “All-on-Four” implants also help to preserve the jaw bone. The entire procedure is painless as the patient will be sedated. Another tremendous benefit afforded by the “All-on-Four” procedure is its ability to almost always bypass the need for bone grafting – a surgery frequently required by more traditional treatment methods for patients with substantial loss of bone structure in the jaw. The “All-on-Four” procedure eliminates the day-to-day frustrations and discomforts of dentures, and patients can once again enjoy the dietary freedom like those with natural teeth. It is the most sophisticated and effective solution available for tooth loss.